If you’re looking for a solar inverter supplier that’s responsive and understands the off-grid solar industry, look no further than Zonna Energy. The sheer number of solar inverters available can be dizzying. Rest assured that when you buy from Zonna we can help you spec out the right inverter for each project you encounter, and you’ll be getting best-of-industry equipment, every time. If you’re looking for more than just Solar Inverters check out our solar energy equipment supplier homepage to see what will be needing more. As a front-running solar inverter manufacturer, Schneider Electric’ is commited to unparalleled return on investment. They work hard to produce some of the worlds most effiecient and balanced inverter systems, carefully integrating battery banks, solar charge controllers, and generators. Schneider Electric also prioritizes their products’ reliability through extensive testing and constant improvements. 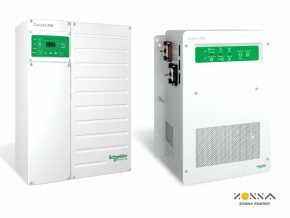 Schneider Electric offers two primary inverter systems for off-grid and battery backup use. The Conext SW Solar Hybrid Inverter System works with solar panels but integrates with fuel generators as well. It prioritizes solar consumption over the grid, if grid-tied. They market their Conext XW+ Hybrid Inverter as an all-purpose product, for grid-tie backup or off-grid solar systems. Scalable from 7.0-76.5 kw, the XW+ is a candidate for commercial and residential off-grid solar systems of any size. If remotely monitoring your clients’ energy usage and troubleshooting issues is important to you, consider Schneider Electric’s off-grid inverters and chargers. With their Conext Combox, you can easily see how their PV site is performing–and with Context Insight, you can monitor multiple sites from any web browser. Diagnose, re-configure settings, and solve problems–all from your office or mobile device! Do you have customers who need renewable energy on the go? 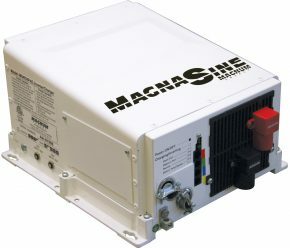 Magnum Dimensions is a solar inverter supplier with a full range of inverters designed specifically for mobile applications, such as boats, RVs, utility service trucks, industrial sites–even emergency vehicles! Your clients can depend on their products to withstand harsh conditions while still providing reliable power. For your clients looking to install an off-grid renewable energy system, Magnum Dimensions has the products you need. Supplying a power output range of 600-4400 VA and scalable to 17,600 VA, we can guide you in choosing inverter chargers to fit any need. You’ll love their products’ ease of use and value for the cost. 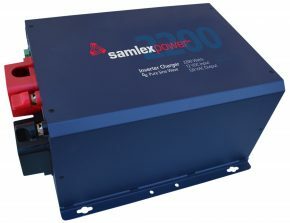 If you want to be linked to a solar inverter manufacturer that first and foremost cares about providing great service, look towards the inverters we carry from Samlex-America. They are passionate about innovative product design and great support, while still offering competitive pricing. They offer both DC-AC power inverters and inverter chargers. Their power inverters include pure sine wave models, suited for powering sensitive technology, as well as modified sine wave models, great for all-purpose energy supply to households or mobile locations such as vehicles or boats. Their inverter chargers have the same capability, with the added convenience of charging batteries. We stand behind the brands we carry and would love to develop a relationship with your business as your long-term solar inverter supplier. We’re here to make sure your selection is simple and your products are trustworthy! Ready to talk with us about the right inverter for your customers’ needs? We’re delighted to answer any questions or help you with an order! Call us at (330) 674-1750 to discuss your project.